Hello conor od. Try Coill Beithe, Caragh Lake, Killorglin. Brand new B&B - very very good. English but well, it's a new world. Think her Da's from there or thereabouts. Very keen to please, beautiful crisp new rooms, also do fine food, fab quiet location, not dear - starting to sound like a brochure. Check them out on the net. Something like 10/15-ish mins from the hills, near the famous Climber's Inn. Good fishing also and endless pubs in Killorglin down the road. Need more info - get Simon to give you my email. Can anybody recomend a good place to stay for 4 oulfellas about to climb Carrauntohil ? On Chimney Rock last Saturday, I noticed she had turned into a hare - and other than a goat or two, my first sighting of an indigenous quadruped on the Mournes in my 10 odd years exploring them. Strange, but the Mournes are quite devoid of serious fauna (pick and mix syntax?). At a fairly confident estimate across the whole range (above the treeline) I doubt if there thrives more than 16 pairs of ravens, 6 pairs of skylarks, 6 pairs of buzzards, a couple of pairs of other raptors, 4 pairs of big songbirds. No grouse, no deer, no hare (until last Saturday). In fact I think there’s more going on in the Gobi desert. Somebody tell me what this is about please. Herself was notable by her summer coat worn in a winter blizzard. A see-it-believe-it measure of warming winters. Pic shows raven roost within - Pot of Pulgarve. As a significant amount of the land that you will be walking on during your average hillwalk in Ireland probably belongs to some farmer, it would be advisable to keep your dog on a lead. Farmers do have the right to shoot any unleashed dog on their lands in order to protect their sheep. Reference SDillmore query ......... Take the dog Ess: everyone else does, increasingly and arguably to extremes. It can be quite amusing watching a Doberman sucking the innards out of a Yorkie or better still mistaking a Jack Russell for one. The issue with the dog in these parts, is the sheep - now it is arguable which has more rights: the poodle or the blackface. If the creature is biddable and understands “no”, meaning very sore ribs, there are no restrictions, other than on Batts land amongst the Hilltown Mournes where Batt clearly specifies no mutts - although I have seen a bloke with 3 Boxers loose on Slievemoughanmore. I suspect it might be bad to take a dog into the Sperrins, in that it is generally bad just to be in the Sperrins. I have 2 personal motley views on the matter: first that dogs and hills go together but second that this only applies to trained beasts and must exclude coiffured stars on extendable leads. You should have no trouble until Rover bites a sheep, whereupon you will be knee deep in it. Hey all. Being new to hillwalking here (I was born and raised in the U.S.), I was curious as to what the general policy was involving taking a dog along during walking, as the bulk of it is on private land. I haven't seen anything to forbid it, but I figured I should get some opinions from those in the know. One cold January day this was the view of Slieve Donard (850m, right) and Slieve Commedagh (767m) in the Mourne Mountains. It was taken from Butter Mountain in the Wicklow Mountains, some 112 km south. The line of sight goes directly across Dublin city and later Dundalk Bay. 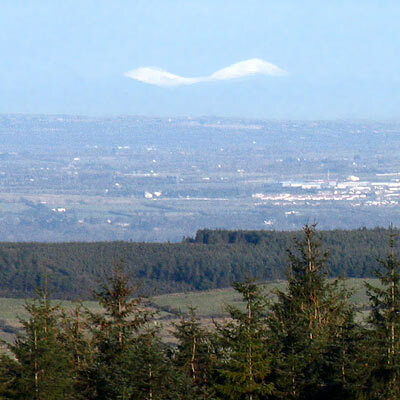 At first when we saw this, it seemed like a curiously shaped cloud. 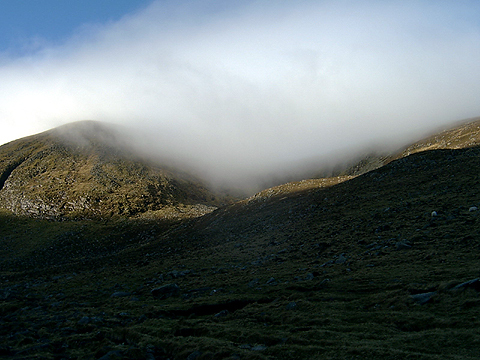 Haze completely obscures the other Mournes so these two summits with a light winter dusting float surreally in space. Collaborative entry Last edit by: Colin Murphy 6 days ago.